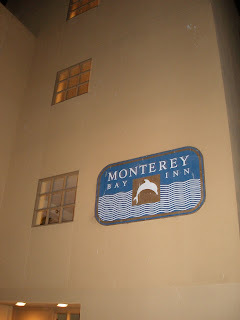 My visit to Monterey this time was both good and bad. The Monterey Bay Inn room was still it's usual comfortable room with a view, but this time the balcony was a smaller...which I did not realize. The ocean view rooms have two different sized balconies. The rooms in the middle (three) have large balconies with iron railing going to the bottom of the deck, but the ones on the end (two, one on each side) have a wall with a short iron railing on top; these balconies are much smaller. I prefer the large balcony as it is roomier and not as closed in feeling, plus I can lay in bed and see more of the ocean. However, the room itself was still comfortable. My only complaint about the room besides the balcony was that the people in the room above (I was on the third floor) sounded like a constantly moving heard of elephants. It was very annoying. If I stay at the MBI again, I will try for a fourth floor room. 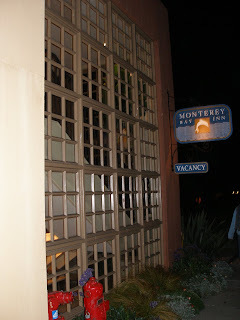 Although, I think for my next visit to Monterey I will book a room at the Spindrift Inn, further down Cannery Row. 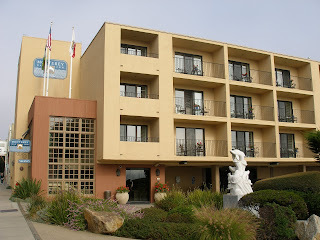 It is a sister hotel to the Monterey Bay Inn. My boyfriend and I checked out one of the ocean view rooms at the Spindrift and found it to be quite large and comfortable. 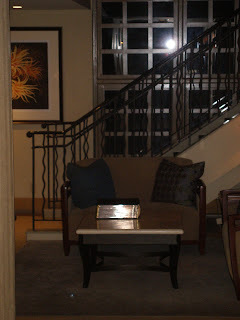 While these rooms don't have balconies, the are right over a small beach and have window seats with windows that open. The theme of this hotel is cozy Victorian.